Racing Service Line consists of selected and exclusive pre-release products from our product development cycle, developed together with top ski teams. Rex HF Gliders in liquid form: The wax is 100% the same – only the application method is different. Recent advancements in solvent chemistry and R&D have resulted in the creation of totally uncompromised liquid versions of our latest HF series gliders. The new Rex HF Spray Glider series continues with the liquid approach we first introduced with our Liquid Klisters, meaning that the wax itself is the same, but only the application method is different. Uncompromised liquid versions of our HF Gliders, suitable for World Cup racing use. Now you can apply genuine Rex HF glider very quickly, without using a waxing iron and scraper. Less mess and faster preparation of skis. Durability is very good, because the wax recipe is the same as in block versions of Rex HF Gliders. With a single can of HF Spray you get as many or even more waxing as with our regular HF block. For new and old snow. The softest wax on HF -series. Compared to traditional warm condition HF gliders the HF11 is relatively hard and not so oily wax. Extremely dirt repellent. For all snow types. Developed for mild to medium frosts, the HF21 is our all time fastest HF glider! Developed especially as an underlayer for fluoro powders, but works extremely well also as a final layer. Engineered especially for new snow and contains a precisely defined amount of graphite. Hardness is positioned between HF11 Yellow and HF21 Blue. What makes a glide wax fast, durable and easy to use? Take a look at our key technologies. Rex FUTURE FLUOR™ is our PFOA-free new generation fluorocarbon technology that fullfills the new 2020 EU regulations. More enviromentally-friendly, and better performance too! Rex N-KINETIC™ nanoparticles in the wax form a hydrophobic surface structure that decreases the suction created by wet snow, and also enhances dirt repellency. Rex POWER POLYMERS™ is a new generation polymer wax blend that forms a strong bond with the UHMWPE base material used in race skis, ensuring good durability. Rex 2-STEP CARRIER™ -solvent technology enables the temporary liquid state transformation of new generation polymer waxes. A liquid wax without compromises. Never has Rex non-fluorinated glide wax been this fast! Rex G-series spray gliders are special fluoro-free versions of our most advanced HF gliders, a successful wax series that was developed together with the best national teams. They feature all the technology advantages of Rex HF-series, without the use of fluoro compounds. 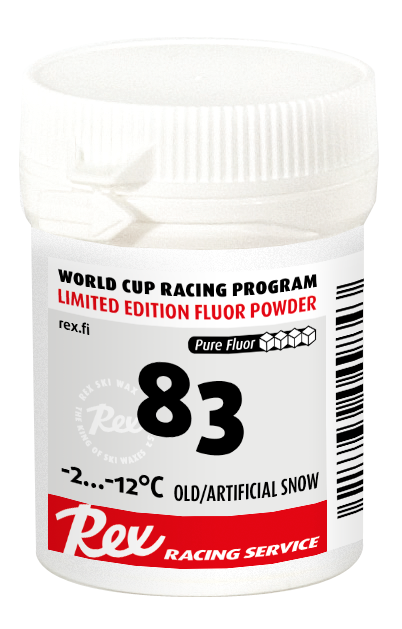 Approved for use in junior racing in countries where fluorinated waxes are prohibited. A fluor-free version of HF21 Spray. On low moisture and artificial snow, its performance is almost on par with HF series, with similar durability. Great wax for training and junior racing. Fullfills the requirements set by Norwegian Ski Association for junior XC racing. Likewise our HF Sprays, it is the most wax-containing liquid glider on the market and does not need hot waxing to support its durability. Fills small imperfections in base material like hot wax, reconditions and replenishes. Never has Rex non-fluorinated wax been this fast. Ample 150 ml aerosol packaging. A fluor-free version of HF11 Spray. On low moisture and artificial snow, its performance is almost on par with HF series, with similar durability. Great wax for training and junior racing. Fullfills the requirements set by Norwegian Ski Association for junior XC racing. Likewise our HF Sprays, it is the most wax-containing liquid glider on the market and does not need hot waxing to support its durability. Fills small imperfections in base material like hot wax, reconditions and replenishes. Never has Rex non-fluorinated wax been this fast. Ample 150 ml aerosol packaging. 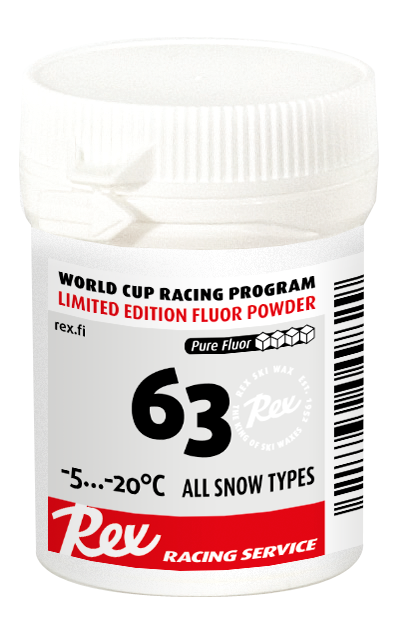 Limited edition fluor powders straight from the World Cup waxing cabin. New powders 77 & 83 launched March 2017! “77” is the powder of choice for new snow. It has quickly became one of the best-selling powders from Rex! A constant powder test winner when the snow is new and relatively dry. 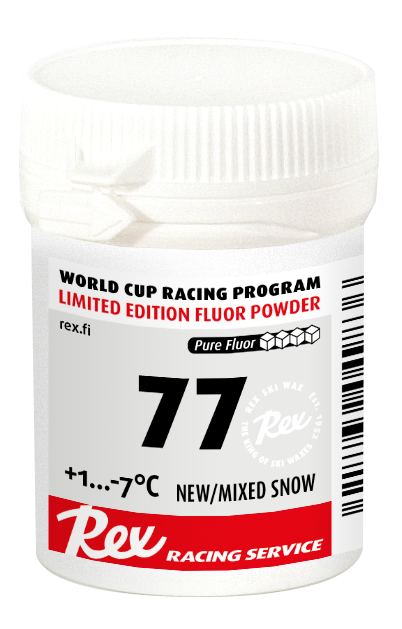 “77” was a result of intensive powder R&D prior to Lahti 2017 World Championships. Made of completely new raw materials. Does not contain graphite or molybdene. A sibling to “77”, the “83” is at its best when new snow begins to transform into older snow. 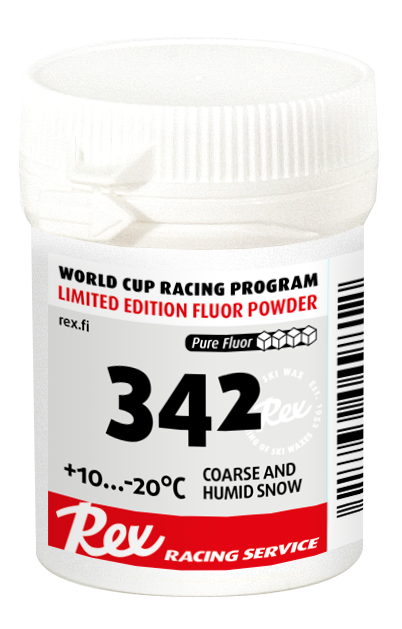 A result of intensive powder R&D prior to Lahti 2017 World Championships, where it dominated during the cold days of the games. Completely new raw materials. Contains graphite. Moist and coarse snow, warm and wet snow. Special powder for moist and coarse snow. Delivers in a wide temperature range, when moist snow. Fluoro powder from cold conditions to mid-frost. Contains graphite. Developed for coating grip waxes. Extremely fine grain polymer wax. Reduces the kinetic friction of grip waxes and prevents icing. Suitable for klister and kick wax coating. Grip waxes with our latest innovations. 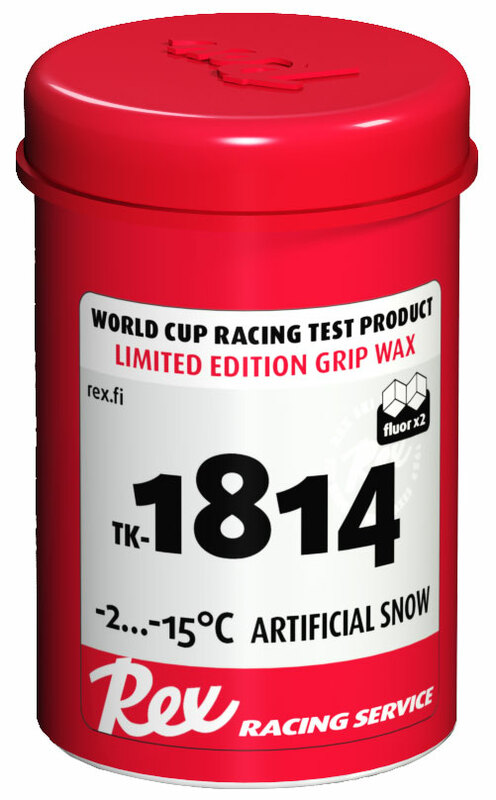 TK-1814 is a new kind of grip wax designed for the conditions that are usual in the world cup during the early season. When the snow has been brought from faraway mountains and spread with a bulldozer, this is the wax of the day. 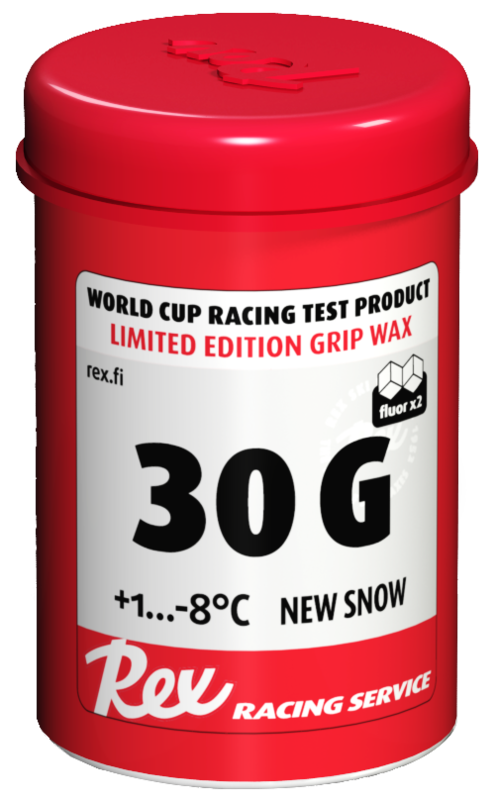 A new fluorinated grip wax for new snow. 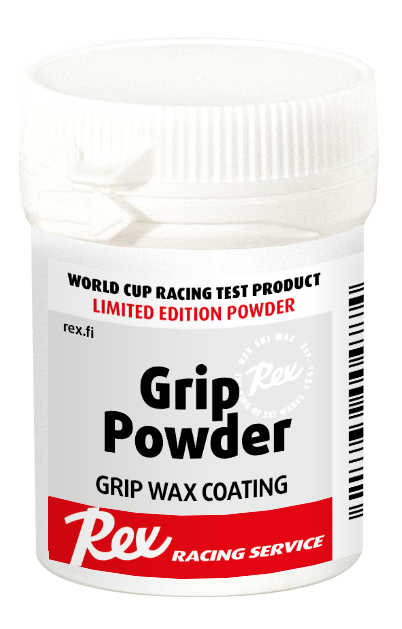 Use as the final grip wax layer on top of harder grip waxes (e.g. blue) when it's snowing. Around 0°C good on its own or combined with klister.